We are in the kitchen trying out a new recipe. I made this yummy loaf and discovered it makes a delightful addition to our afternoon 'Tea at Three' ritual with hubby. It's a new favourite in this household. As I browsed through the recipe book, I was captured by the word quick and by the list of ingredients which make me think of fragrant fruitcake filled with raisins, cinnamon, cloves, and ginger. The original recipe was found in Great Breads by Martha Rose Shulman -- below is my adaptation. Here's wishing you a fistful of raisins! Oh that sounds so good with the raisins soaked in tea first... I pinned it, giving proper credit here of course. If that's a problem, do let me know. Oh yummy, this is very tempting. I'm intrigued by the choice of black pepper among all those spices. Your website is very beautiful and the caption you have added to it increases its beauty more. 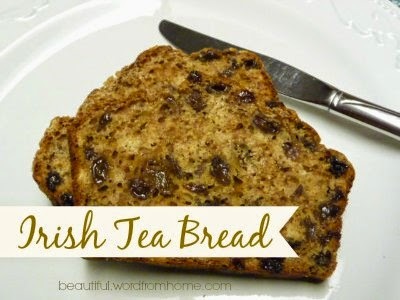 I will surely try out the recipe of Irish tea bread. It looks so yummy. 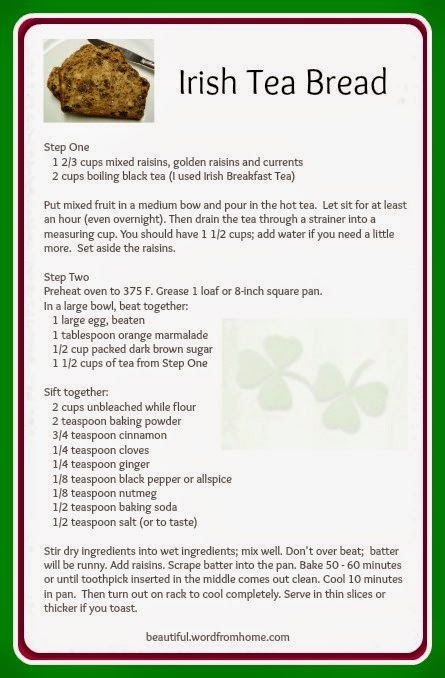 This is an interesting and tasty addition to the recipe menu of mine on tea time in evening. I always try different recipe every day.